"He's at the point of no return. All we can do for him is keep him from killing to save his neck." Flic Story is based upon the memoir of Roger Borniche, a member of France's Federal Police. The story, as conveyed by director Jacques Decay and his co-screenwriter Alphonse Boudard, seems like it was born for the screen. There's suspense, intelligent characters, excitement and, most importantly, heart. Borniche (Alain Delon) narrates the story of a famous 1947 case. A notorious criminal, Emile Buisson (Jean-Louis Trintignant), escapes from prison and immediately resurrects his gang to carry out robberies and murders. Borniche and his team of detectives are hyped as "super police" by the media, but they're efforts to apprehend Buisson are thwarted, resulting in numerous murders and bad press. The film pays a surprising amount of attention to inter-office politics, as Commissioner Vieuchêne (Marco Perrin) wrestles with the local precincts and angles to find a promotion in this case. Borniche is portrayed as a determined detective, but a man who is not especially astute when it comes to handling his department's bureaucracy. As Buisson eludes his pursuers, the story shifts between his flight and Borniche's pursuit. It's not merely a collection of chases, but rather some careful character scenes that are punctuated by the violent elements of the script. Buisson is a psychopathic killer, causing fear even among his associates who fear they may be his next target, but the script does not merely feel content to leave him at that. Through backstory and Trintignant's performance, the evil of Buisson's acts is partially explained and adds a layer to him that most movie villains lack. Borniche is also an intriguing character, for he is the embodiment of the saying "still waters run deep." As the story progresses, more is revealed about Borniche's personal life and past, making his actions resonate more strongly than they otherwise would. The greatest strength of the film is that it is not truly a cops-and-robbers thriller. Ultimately it's about the relationship Buisson and Borniche have to one another, though they never actually meet during the investigation. It is a violent film, with the later scenes becoming far more graphic than the earlier ones, but there's a purpose it. Deray is not trying to shock his audience or enthrall them. Instead, he uses Buisson's acts as a symbolic representation of the character's mental state. As he plunges further into his own hell, the film follows him. Thankfully Borniche is the lead character in the story, giving the audience many breaks in between the scenes of violence. Alain Delon and Jean-Louis Trintignant carry the film through to its conclusion. Delon is commanding in the leading role, but Trintignant steals the show. I found myself fully engulfed in his portrayal of Buisson, because he superbly captures the vicious nature of the man and still makes him tolerable for the audience. The other actors are effective in their minimal parts, though they merely seem to exist for the purpose of revealing aspects of the two lead characters. The taut filmmaking and intelligent script make Flic Story a wholly satisfying movie. Like the bet of the genre, it realizes that the key ingredient in these films is not the suspense, but authentic characters who operate consistently according to their nature. Image Transfer Review: The 1.66:1 anamorphic widescreen transfer looks quite nice, with good detail and a strong filmlike look. The age of the film is noticeable, with a constant grain presence that cannot be hidden. Apart from that, though, this is a fine transfer. Audio Transfer Review: The original French mono track is preserved on this DVD and sounds nice when spread across he front sound stage. There's nothing flashy, it's just a clean mix for your enjoyment. Still Gallery�a collection of still photographs from the movie. Extras Review: Extras are pretty scarce, consisting of the original theatrical trailer for Borsalino and Co. and the trailers for The Sicilian Clan, Les Clan des Siciliens, Deux hommes dans la ville, Borsalino and Co., 3 hommes à abattre, Pour la peau d'un flic, Parole de flic, and Ne reveilles pas un flic qui dort. Each of them stars Alain Delon and is shown in nonanamorphic widescreen and without subtitles, with only The Sicilian Clan being in English. There's also a brief still gallery that has photographs from the film and the original theatrical poster. Finally, there's also a selected filmography for Alain Delon. The extras are very weak, but fortunately the movie makes up for them. 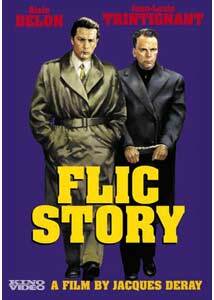 Flic Story is a real treat for film buffs. The audio and image transfers are fair representations of the source material, but extras are meagre. Nonetheless, this DVD is worthy of purchase.